Gink and Gasoline recently shared a post entitled "Has Distance Casting Hijacked Rod Design?" GnK alum Kent Klewein argues, correctly I believe, that it has. Go on and read it and then come back. This discussion got even more interesting when no less an icon than Kelly Galloup posted a follow up video to YouTube about the effects of evolving rod development (skewed toward distance casting) on fly line design. Go ahead and watch it. My friend Brett Watson makes another point- that with the increasing specialization in fly fishing, fly rod design is starting to cater to all those specific needs. The rod you use to swing for steelhead is completely different than a rod you would use to Czech nymph. Nymphing, streamer fishing, throwing bass poppers, musky flies (and doing figure eights), dry flies, indicator fishing for steelhead all require different rods and matching lines. In fact Brett say's he's starting to consider buying specific rods for specific RIVERS. I don't believe this is as crazy as it sounds. 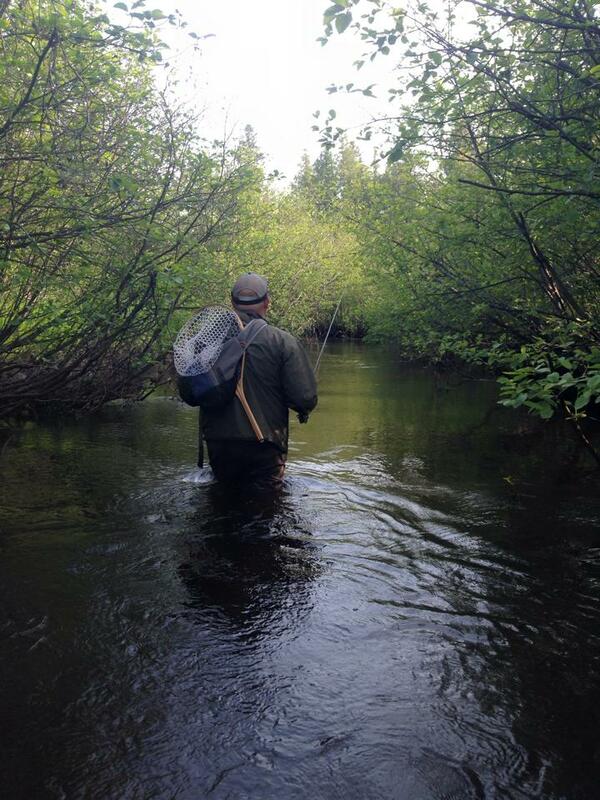 He mentions looking for a rod for a small brook trout stream in Northern Michigan. In this case you know the size of the fish (8-12"), the length of your casts (15-30') and the size of your flies. He wants a 3 weight fiberglass rod, which I believe is perfect. That is, of course, if he picks the perfect blank and builder. I started out in fly fishing like most of you- making a five weight work for everything. Dry flies for trout, small streamers, nymphing, and even trying to throw bass bugs, and streamers for small pike. Once I started mousing for browns at night the need for another rod became imperative. The five weight simply would not turn over the big flies we were casting, and trying to contain a big angry brown in the darkness and the confines of a small woody stream was almost impossible. I was still trying do as much fishing as possible with as few rods as possible, so I bought an 8 weight. The eight weight accomplished a lot of goals. It was more than adequate for turning over mice and handling big browns. It made a good steelhead stick. I also needed it to cast long distances in high wind for carp on the flats, so I bought a Temple Fork Outfitters TiCRX. Not perfect for all those hats, but it definitely handled them all adequately, especially the flats fishing. The flats fishing is a special situation. I'm casting to carp at distances of 25 to 80 feet. The TiCRX handled it with panache, and it especially handles a sixty foot cast into a brisk wind easily. Provided you have the right line. When I started flats fishing all I had was a steelhead nymph/indicator line, which I made work despite its shortcomings and actually landed my first carp on it. But the line wasn't perfect as I was to find out. My friend Tom Hazelton gave me a prototype fly line designed by Bruce Chard. I believe it's the Mastery Grand Slam line by SA. I'm not trying to sell you something, just relate a story. Anyhow, this line punches wind like you wouldn't believe and makes those 80 foot shots possible. Truth be told I've caught most of my fish at less than 50 feet, but I have caught a few at that extreme end. Forty feet is probably the average shot at carp there however. The only situation in which I ever regularly cast over 70 feet is when fishing for muskie. We're throwing 11 weight rods typically with 450 grain sink tips. The flies are huge, but the line is so heavy that it just whips the whole thing out there. On a couple days when Tom and I were really on our game we were regularly making accurate casts over 100 feet and fishing them. As I recall the fish pictured below came on a cast in the 70-80 foot range. For reference, the line is 95 feet long, our leaders were about 6 feet long, and our casts ranged from having 3-4 turns of line left on the reel, to casting a few feet of our backing. While we were making accurate casts to specific spots, this was hardly sight fishing to specific fish. It was more of an attempt to cover as much water as possible with the least amount of casting, and it was very effective. All this brings me back to the gist of the Gink and Gasoline post and Kelley Galloup's video- that distance casting is over-rated. I've caught a handful of fish at over 50 feet, but those shots and situations are so rare as to make them the exception rather than the rule. 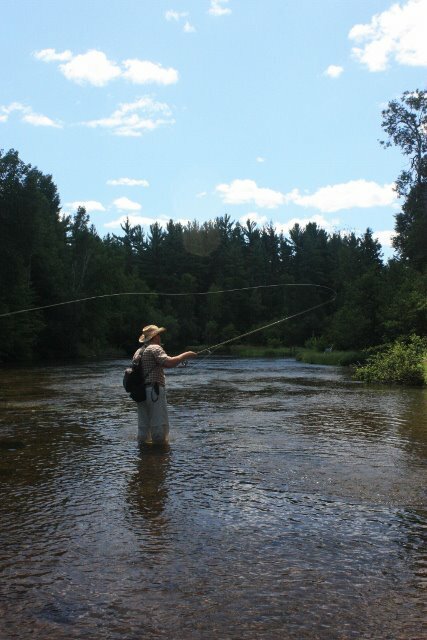 Except for a handful of streams like the Au Sable, Michigan streams are quite small and shots over 30 feet are rare. Also due to their nature, very few stretches offer a uniform flow across a big enough area to get a good drift out of a long cast. In 90% of situations, stealth and good presentation are far more important than distance casting. You often only get one or two shots and you need them to count. In the isolated situations in which distance casting is needed, then modern rod designs really shine provided you can load and release them properly. I don't know that I've added much to this discussion, except to say that when you're rod shopping, being able to load the rod and then cast accurately is far more important than how far you can cast it. The bottom line is match a good rod and line to the water and fish you're after and focus on your stealth and presentation skills. Aaaaauuuuuppppppffffffffftttttt!!! Yawn, stretch, scratch repeat. It's Monday, so let's have some coffee. I haven't fished much the last couple weeks between work, weather, and lack of opportunity, though not for lack of desire. So last week I made up my mind I wanted to fish Saturday. 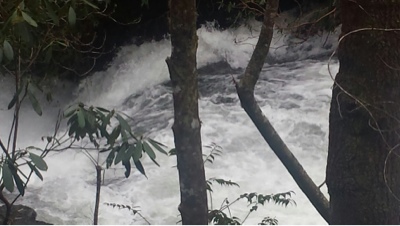 We made the drive north into the mountains to try and fish various tributaries of the Chattooga river. We made it to the first access I wanted to reach and poked around a bit. When nothing came out to play at the first bridge, we crossed the river and followed the trail upstream, stopping to fish at a rapid and waterfall. No such luck there, so we tried to push on around the falls and upstream. The water was still high from the previous day's rain, which hampered access somewhat. I've found too, that getting around these mountain streams can be difficult to hazardous. Anywhere there's a fall, it means the mountain generally pinches around the stream. If you can't climb straight up the fall, you have to climb the mountain. So climb the mountain we did. At first it wasn't too bad, but soon the slopes began resembling cliffs, and the rain had left the ground and roots and rocks slick. A glimpse of a waterfall coming off the gorge wall and falling a few stories beckoned, but we soon reach a place where the ledge we were on was only as wide as your foot, and a mistake would have been unforgiving, so we turned back. We went to a smaller creek, but by then it was late in the day, and perhaps due to the recent high water, I didn't find any fish. Next time. It was still a pleasant outing marked by extreme beauty and nice weather. I have several posts ready to drop here on FR and I'm hoping to finish them and get them out soon. My attention has been somewhat taken by conservation matters. I'm researching a story for Gink and Gasoline about the expansion of a private fish farm upstream of the Holy Waters of the Au Sable River in Michigan. What I'm finding is disturbing. They basically want to use clean public water, pollute it and discharge it untreated back into the trout stream. Profit from a public resource with little cost to themselves. This story alone would be disturbing enough, but according to their filings it's part of a major push to establish a multi-billion dollar aquaculture industry in the Great Lakes. The same forces have introduced legislation in Wisconsin to do similar- make reckless changes to trout streams without regard to the health of the watershed, then discharge pollution into the river from their "farms" with little to no waste water treatment required of them, and introduce this kind of reckless aquaculture on a wide scale throughout the region. Please- contact your local conservation organization, whether it's Trout Unlimited or another group and see how you can help. Contact your local state representative and let them know you oppose the industrialization of trout streams and clean water. Clean water and conservation progress of the last 60 or more years are under attack like never before. Let's not let all that has been accomplished be undone by greedy private interests. I'll have more specifics in my Gink and Gasoline article, but don't wait. Time is of the essence. I'll have links in the article, but you can go to the Anglers of the Au Sable website to donate to the legal battle if you are able. I know. Just when you thought it was safe to go into the water again. But my coffee is gone and it's going to be a good week. Let's get after it. 2015 was a blur (isn't every year?) but I did get a lot of fishing in, learned a lot, made some new friends, and had a good time. Here's some of the highlights from the year. Toccoa River float with Louis Cahill. We saw a couple really big browns on this float, but only landed small fish. Still a great time getting to know a good guy. Maybe I’m getting to that point where the people I spend time on the water with matter more than the fishing. Pere Marquette River/Barothy Lodge with Chris Reister. It was late March. We stayed at a fancy cabin with a whole crew of guys from Detroit. It was bluebird/T-shirt weather, the steelhead bite was off, but we managed a couple fish and had a great time. Any trip with Alex Cerveniak. Streamer floats, opening day of trout season, getting lost in the Pigeon River Country, night fishing, bumming around the UP- Any trip with Alex is a good one. He’s one of my best friends and one of the best people you could ever hope to spend a day on the water with. I don't think our season was nearly as productive as the previous, but who cares? Lower Black River with Zach Ginop. We were after musky. We caught pike. It was a rare day off during my busy season. If Zach weren’t so modest then probably everyone would know his name- he’s a superb and innovative fly tyer, a great guide, and the fishiest young guy I know. He catches more brown trout over 24 inches each year than you’ll ever catch in your lifetime. The Upper Peninsula with Tom Hazelton and Dave Karczynski. Big smallmouth on Lake Michigan, and big rainbows inland. It was a great evening of technical fishing in which we caught a couple, had our butts handed to us by some much bigger fish, and had a great day messing around in the north. Carp on the flats solo. I had my best day ever carp fishing in early July. I took the kayak to be more mobile and landed 6 nice fish in less than two hours. A beautiful day in a beautiful place with lots of action and aggressive fish. Florida, late August. I went with my girlfriend to Sarasota area and scored my first saltwater fish on the fly. The threadfin herring run was on and fish were busting in the surf and canals everywhere. Yeah, I only caught ladyfish and a couple other small species, but it was a great intro and I learned a lot. I had some close calls with snook, barracuda, a bonnet head shark, and was broke off by a Jack Crevalle. The salt definitely calls to me, and could easily take the place of all my freshwater pursuits. I shared the water with a number of other good folks (you know who you are Brett Watson) and had a good time. I want to thank everyone for a great year and great company. Here's to 2016. For many miles we drove on over the rough gravel road, climbing the ridges and switchbacks, battling incipient vertigo while checking out the creeks in the valleys far below, swerving to avoid the Subaru with the kayaks on top, winding our way to the forest service bridge replete with a parking space, stone chairs and charcoal scars from old fires. In the pool below the falls, a brown trout snaked up off the bottom, and when it turned and paused I set the hook.